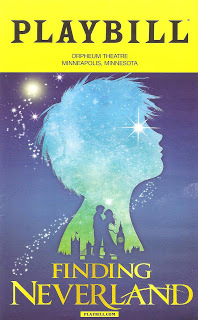 TCTB Blogger Review Roundup on Finding Neverland at Hennepin Theatre Trust, which closes this weekend. "It's miles better than the recent movie and well worth a stop if you want to escape our early November snow." "Even if it's not the most original musical you'll see, it's still quite delightful in execution." "The musical stage adaptation of Finding Neverland is beautiful, colorful, imaginative, and alive. " "I can confidently say that my expectations were not only blown away, but they were shoved in a cannon on Captain Hooks ship and blown miles away. It was an absolutely charming, surprisingly touching, nostalgic musical."